Made in Britain with a focus on quality and a keen eye for detail, our range of solid wood kitchens are a desirable addition to the heart of any home. Hand finished in any Farrow & Ball colour, every kitchen is individual to you. Our kitchens offer a range of elegant styles including a classic beaded door, a simple shaker door or a contemporary slab door all in our signature in-frame style. 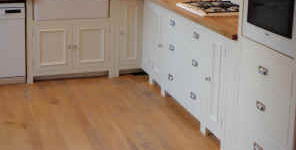 Finish internally with oak cabinets, shelving and a range of desirable details such as spice racks, vegetable boxes and dining trays our kitchens create the wow factor in any home. High quality hand made kitchens in North Wales. You can be assured of only the highest standards of craftsmanship tailored to your needs, so visit us today and with our expert help and advice, you could be cooking up your favourite culinary delights in the kitchen of your dreams. As a finishing touch or an update on an original kitchen, the worktop you choose can may a big difference. We have all the popular styles in different thickness and also offer the deeper 900mm worktop, ideal for creating a breakfast area or an island unit. 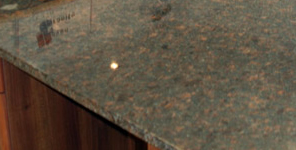 For something a bit different why not choose a wood block style or the luxurious feel of cool granite. At the centre of any kitchen is the cooker. 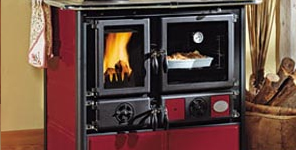 We specialise in range cookers such as the traditional Rayburn and Redfyre or the more modern Rangemaster gas cookers. Offering increased cooking space and giving a grand feeling to any kitchen, they are certainly the chefs choice. 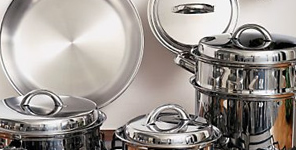 We also offer a full selection of built in or freestanding cookers. Click here for further information. Choose wall and floor tiles to complement your new kitchen or as a inexpensive way to revitalise your existing kitchen. Our sinks come in all kinds of shapes and sizes. For modern styling, try a simple circular bowl and separate drainer or for the country feel, try a large 'Belfast' sink. Complement this with your choice of taps. A large swan neck tap for traditional elegance or a tap with a pull out hose, a practical and solution for washing vegetables. 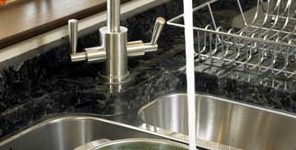 We deal with all the big names such as Franke, Astracast and Deva. We are and official dealer for the quality products from the Aga Cookware range, offering a selection of pans, kettles, oven gloves and much more.